Palmyra has become a buzzword for Russian involvement in Syria, with the Kremlin taking credit for helping to liberate the ancient city from the Islamic State’s control and save it from total destruction. So it might seem odd that “Palmyra” was one of the main contenders for the name of a new nuclear missile that President Vladimir Putin announced during his state of the nation address. His speech on 1 March was accompanied by images of missiles striking Florida in a video-game-like animation. Almost immediately, Russia’s Ministry of Defense launched an online vote to choose a name. “Palmyra” led the vote until just before Putin’s re-election on 18 March, when “Thunderbird” suddenly pulled ahead—leading some to speculate about vote-rigging. The latter name won today (22 March) by a small margin, with 748,471 votes (34.38%) against 720,072 (33.08%). 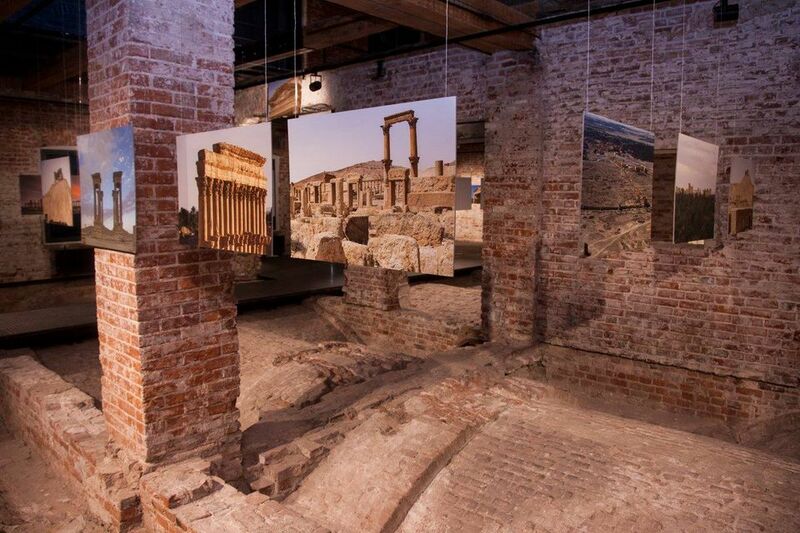 The competition coincided with Russian museum exhibitions devoted to Palmyra. An exhibition at the Schusev State Museum of Architecture (until 23 March) displays 18th and 19th century engravings of the ancient city from the museum’s collection as well as loans from the State Hermitage Museum. It also includes photographs and drone footage taken in 2016 by a team of archaeologists and antiquities experts from the Hermitage and the Institute of the History Material Culture of the Russian Academy of Sciences. 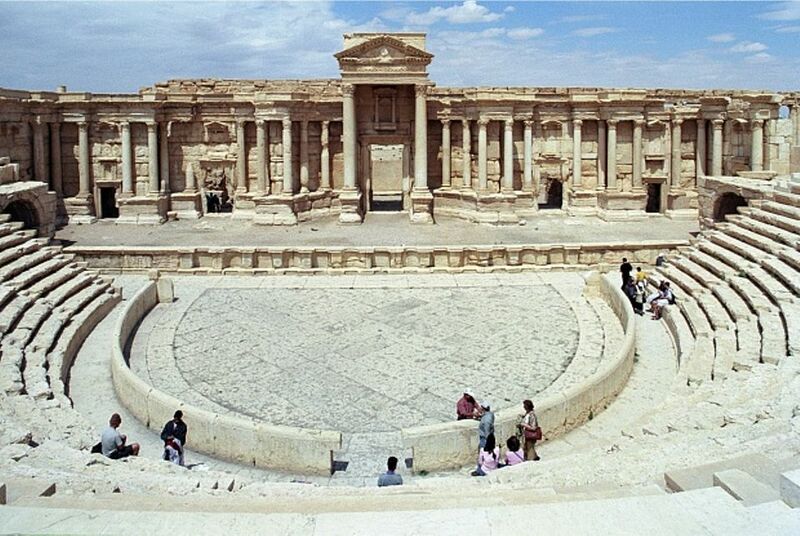 The drone documented the destruction and pillaging of Palmyra’s monuments, including the Temple of Bel and funerary towers..
Russians are especially sensitive to the destruction of Palmyra because of the ruin they faced at the hands of the Nazis during the Second World War, said Elizaveta Likhacheva, the director of the Museum of Architecture. The destruction of Russian monuments by the Bolsheviks following the Russian Revolution was not as bad, she said, “because in Soviet times the serious destruction of churches continued only through the first half of the 1930s”. She added that “there were people who tried to save everything they could save,” and made note of an exhibition running at the museum on Pyotr Baranovsky, an architect and restorer who risked his life saving historical monuments in Russia. The section of the exhibition devoted to contemporary photos of Palmyra opened with a shot of Putin’s friend, the cellist Sergei Roldugin, playing a dramatic surprise concert in Palmyra in May 2016, after Russian-backed Syrian forces retook it from Isil. Roldugin was identified in the Panama Papers as the “secret caretaker” of Putin’s alleged wealth. Putin later defended him as a philanthropic businessman. More importantly, Piotrovsky told The Art Newspaper, Putin spoke in his address of “broadening the cultural space”, proposing the construction of new arts and exhibition spaces around Russia to bring the culture of its capital cities to the regions. The first one, as specified in his speech, will be in Vladivostok, near the country’s border with northern China and North Korea. Putin has since proposed others in Kaliningrad and Sevastopol in Crimea, which was annexed by Russia from Ukraine in 2014. While visiting Sevastopol on 14 March, to mark the fourth anniversary of the annexation, Putin said the centers should have exhibition spaces for “our leading museums,” including the Hermitage, the State Russian Museum and the State Tretyakov Gallery.